Improve your photography techniques. Join underwater photographer Damien Siviero on his daily underwater photography workshops. 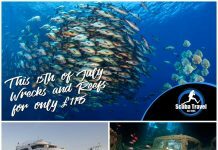 Shark Shooter 7 nights – 26 Dives (4-11 April 2019) – Combines 4 nights in the Coral Sea with a focus on sharks and 3 nights on the Ribbon Reefs capturing the diverse macro opportunities. 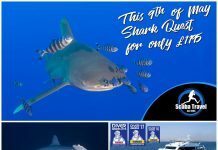 Shark Shooter 4 nights – 14 Dives (4-8 April 2019) – Adventure diving in the Coral Sea. Excellent visibility, exciting wall diving and shark action. Macro Shootout 3 nights – 12 Dives (8-11 April 2019) – We take you to the Ribbon Reefs’ best sites for excellent macro photography. Daily workshops with award winning photographer Damien Siviero. Cod Hole – Buddy up with diver size cod. Osprey – Big fish action in 40 meter visibility. Observe & photograph the rare and ancient Osprey nautilus. Shark attraction dives. 100’s of sharks. Spectacular topography, visibility & pelagics at False Entrance. Ribbon Reefs – Best fish & coral biodiversity. Bougainville & Osprey plus the best Ribbon Reefs. Bougainville – Plummeting clear blue waters, giant potato cod. Spectacular big fish action at Crystal Plateau. Photograph the rare and ancient Osprey nautilus. Rare opportunity to observe & photograph ancient Nautilus. Leading the way in the Australian dive industry since 1969Mike Ball Dive Expeditions operates exciting 3, 4 and 7 night liveaboard scuba diving expeditions departing from Cairns to some of the best dive sites on the Great Barrier Reef and Coral Sea. Enjoy spectacular biodiversity on the northern Great Barrier Reef including the world famous Cod Hole, or venture out into the remote Coral Sea for exciting big fish action, shark encounters and excellent visibility.Spoilsport is Australia’s most awarded dive liveaboard, custom built for diving and with a twin-hull design that maximises space, stability, and comfort. 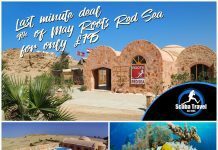 Plus our procedures allow greater freedom for divers with an ‘open dive deck’ policy resulting in no restrictions on bottom time.Great diving, just as you like it.